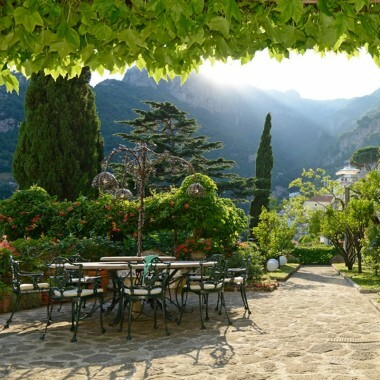 This large villa is built on the original XIII century monastery of St. Francesco monks, on a hill between Amalfi and Atrani. 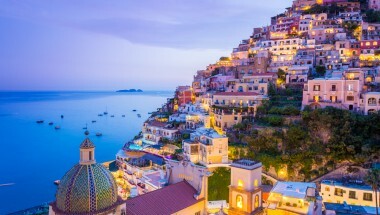 It offers unique panoramic views with Atrani on one side, with its maze of houses on the hillside and, on the other side, Amalfi and the blue Mediterranean. 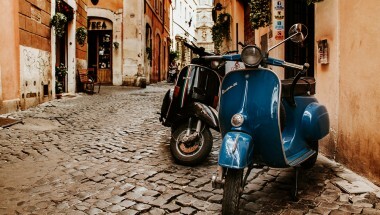 It is just 500m from Amalfi, with shops, restaurants, the port and beach. The closest restaurant to the property is 200m, and the closest beach approximately 500m. The villa is reached from the main road up a 200m public walkway that cuts through a small country road, and includes approximately 200 steps. There is also a lift from the main road, which operates according to a timetable. The villa rental is built on three levels, with access from both the ground floor or from the top floor. The interiors are elegant and typical of the area with original wooden beams, hand painted ceramic floors and exposed stone and immaculate white walls. The main entrance is on the top floor, where there is a large open-plan living area, separated into three different areas by arches and columns. The kitchen, decorated with Vietri ceramic tiles and with wooden shutters, is accessed from the living area, and also from the main terrace. The view from the terrace is breathtaking over picturesque Atrani, in a high position, and dominates the tower bell, the majolica cupola, the small coloured houses and the sea. The remaining bedrooms are on the two lower floors, with high vaulted ceilings, wooden beams, hand painted ceramic floors, and equipped with LCD screens, air conditioning and heating. Each has its own private bathroom, with bath or shower, hairdryer, mini bar, balcony or window with front sea view. Outside the villa there a lemon grove, and a swimming pool, in a panoramic position directly overlooking the sea. Guests at the villa can enjoy the facilities of the adjacent 4* Hotel, with restaurant, parking facilities, and a private beach. Open-plan living areas, with a small flight of stairs leading up to a small double bedroom with terrace overlooking the sea. Large kitchen with professional stove top and oven, microwave, large refrigerator, washing machine and dishwasher. Large terrace with magnificent views. 7 bedrooms with en-suite bathrooms. Large terrace with views. Some bedrooms allow an extra bed (up to 4 extra beds no extra charge). There is also a junior suite, composed by a bedroom and a private living room with sofa and LCD screen which can accommodate four people. 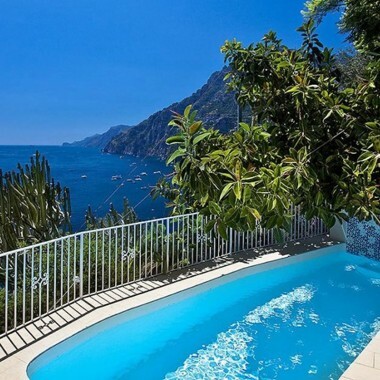 This large villa to rent is built on the original XIII century monastery of St. Francesco monks, on a hill between Amalfi and Atrani. It is just 500m from Amalfi, with shops, restaurants, the port and beach. Outside the villa there a lemon grove, and a swimming pool, in a panoramic position directly overlooking the sea.